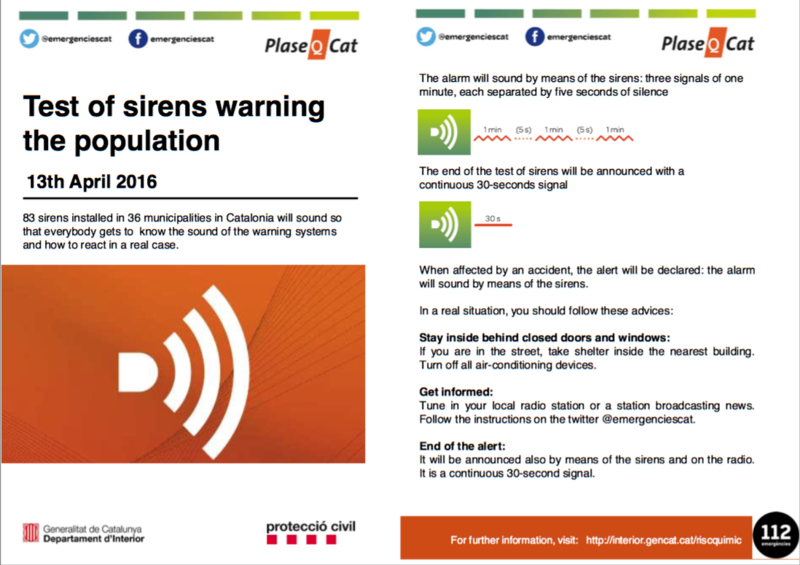 On the morning of Wednesday 13 April, 83 warning sirens will be tested across 36 municipalities of Catalunya. They are chemical warning sirens and the aim is to ensure that citizens know what to do in case of an industrial accident. According to the information from the government, the sirens in the areas of Flix and Tortosa will be sounded between 10.40am and 10.50am. There will be three signals of one minute, each separated by five seconds. The test will end with a continuous 30-second signal. In a real emergency, the advice is to stay indoors with windows and doors closed and air conditioning off, don’t go to collect children from school as they will be looked after there, tune into local radio, and follow @emergenciescat on Twitter. More information at interior.gencat.cat/riscquimic where there is a useful film (in Catalan, but it’s fairly clear from the images). Leaflet (pdf) in Catalan, Spanish and English here.